Some of these modules have specific parameters you can edit. Let's take a look at them. 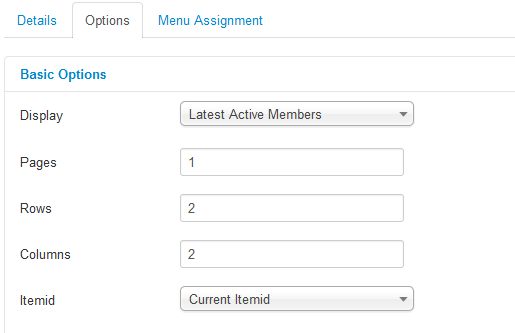 Edit the number of groups displayed and choose the sorting method, by the number of members or posts. Additionally, you can select an ItemId or write a class suffix. This allows individual module styling. On the frontend, you will find the displayed group, which will be sorted by the chosen method. On the left side you will find the number of members of each group and on the right side, the name of the groups. Clicking on one of them will redirect you to the group's main page. Below this, you can also define the layout of the module by setting the number of pages, rows and columns to be displayed. On the Advanced Options tab, you will find different filter options. You can enable the option to filter by gender, by membership or filter out users without profile photos. In case you configured opposite genders for the Gender field, you can also filter them on this module. 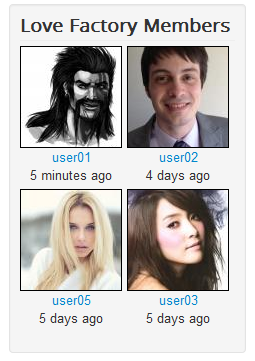 This way, it will display only opposite gender profiles to the current user. Enable user gender filter will add a configuring option for users to check for themselves which gender they wish to be displayed. For this module, you can also choose to Show the usernames and the behavior of profile links to either open a new window or to redirect the user on the same window. 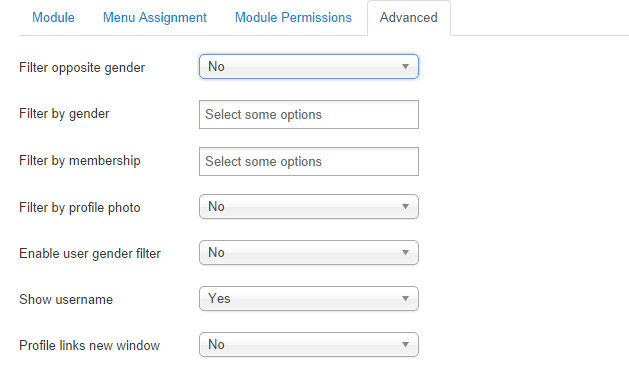 Here is how the module is displayed on frontend when set to a 2 by 2 layout. 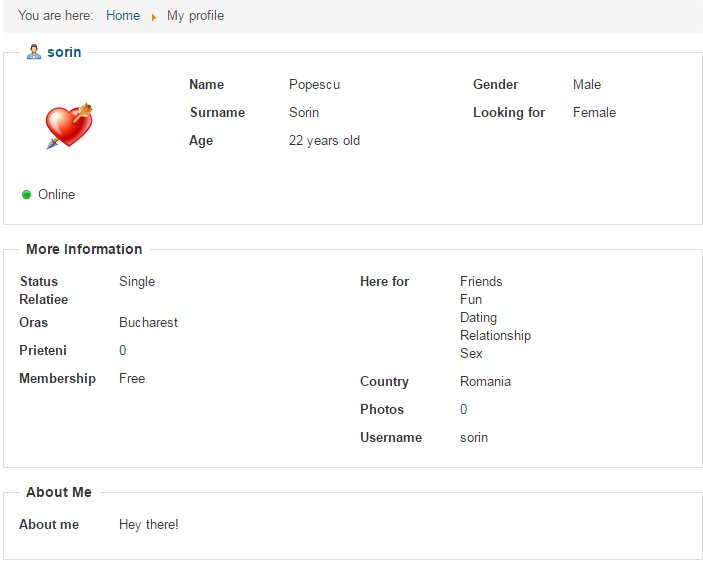 Clicking on the user's photo will redirect you to that user's profile page. 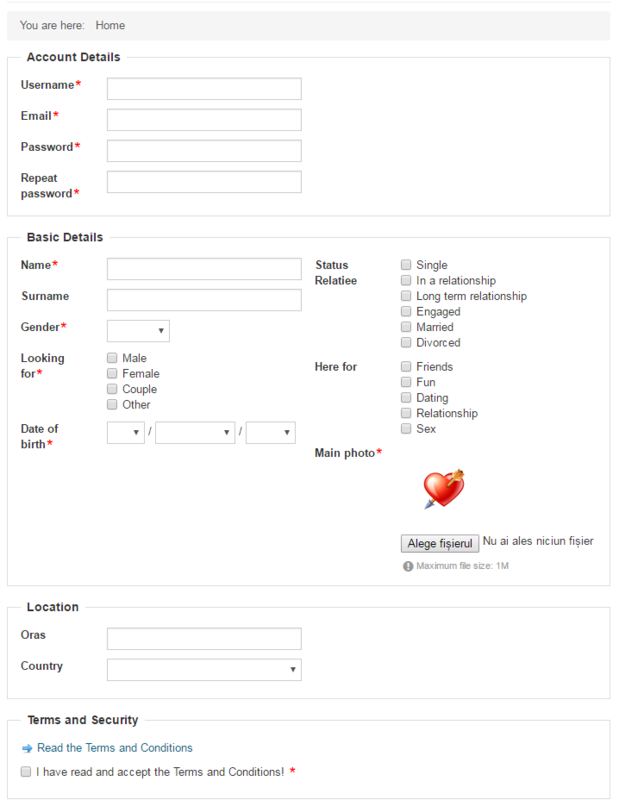 Love Factory Search allows you to chose the type of the search form, quick or advanced. 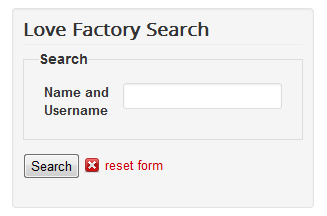 The module has the same forms as the ones from the Search page of the user's menu. 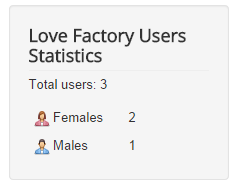 Users Statistics module displays the number of users registered within the component sorted by their gender. You can customize this module to display custom gender names and icons. The ID's for these options are: 0 → Male, 1 → Female, 2 → Couple, etc. If those keys are present in the module's language file, then those strings will be displayed. 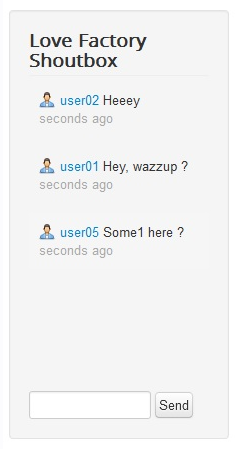 The Shoutbox is a place where users can communicate instantly as a group. The access to read or write is granted by memberships. The shoutbox is displayed on the frontend via a module. After you have enabled it, go to our Love Factory - Configuration Guide to find out how to configure it. 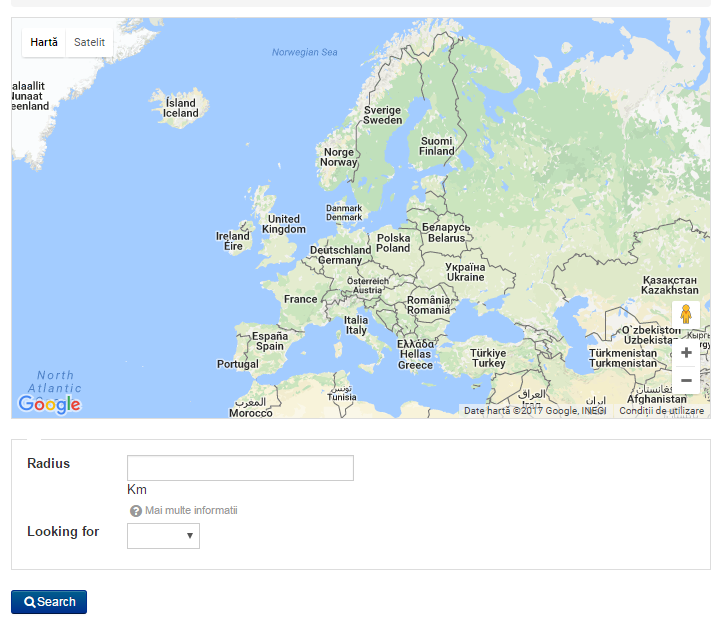 These newly released modules allow you to place the content of Registration, Radius Search, Profile and Friends pages on any module position within the website. This allows users for a quick navigation and gives you, as an administrator, more diversity in the customization of your website. 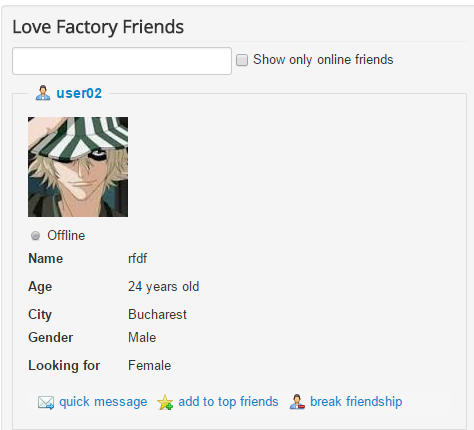 Keep in mind that the Love Factory Registration is a wide module, so publish it on a position that will fully display its features.